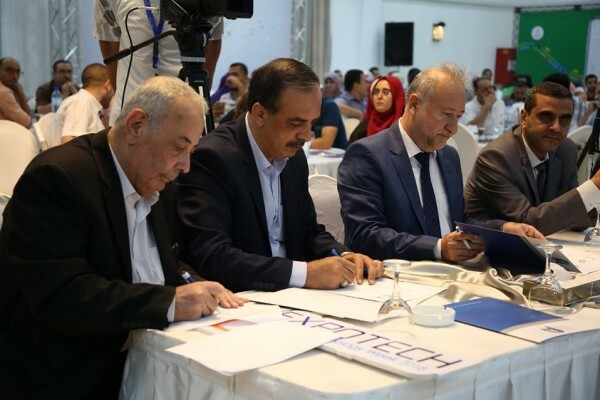 The 15th Palestinian Technology Week kicked off on Tuesday with the participation of international and local organizations , and in parallel between Ramallah and Gaza under the slogan ” Towards a better future “. The week, organized by the Palestinian Information Systems Association, is organized by the Palestine Telecommunication Group and sponsored by the Palestine Telecommunication Group and sponsored by Bank of Palestine for the 15th year in a row, in the presence of international and local IT experts. The technology conference was held on September 25, the main event that reflects the role of technology in the operation and economic development, in which various topics were discussed through hosting experts and information men in strategic and leadership sessions on the role of technology in operation and economic development. A session on outsourcing to the Gaza Strip and regional and international trends on telecommuting. The first session of the conference was held in Gaza under the title: “The role of technology in the development of economic sectors and increasing the employment opportunities”, in the presence of a group of experts and specialists in the same field, and discussed in depth discussions in reality and horizons the role of technology in the operation and economic development, Such as the industrial, commercial, service and other sectors. The session discussed the mechanisms and how to turn employment opportunities from temporary opportunities to sustainable production opportunities using technology, and to work on the production of cross-border software in light of the suffering of the Gaza Strip from Israeli siege and measures. Experts stressed at this meeting the importance of networking between economic sectors. As a result of the meeting, an agreement was signed between the Palestinian Fund for Employment and Social Protection and the Palestinian Information Systems Association (BETA) to create a one stop shop, which will be a reference and statistical reference center within the private sector institutions. And guidance for individuals and companies. In addition to the signing of a memorandum of understanding for partnership in designing the program of employment and development with other economic sectors to promote youth employment opportunities. This agreement was signed between the Palestinian Information Systems Association – BETA and the General Union of Industries, as well as the Gaza Chamber of Commerce and Industry to integrate technology into its strategic programs and to enhance operational production programs. During the conference, a specialized session was held on industrial intelligence and modern technology, which dealt with the importance and strategic relationship between the development of modern technology and industrial intelligence in the development and economic development of the pro-opposition and the public referendum on the results and after hearing the jury. The outputs emphasized the importance of the role of modern technology in increasing employment opportunities. In a special session, the attendees and a large number of experts and specialists discussed presentations in the field of “Models and Experiences for the Use of Modern Technology in the Development of Economic Sectors.” The company also provided inputs from major international companies such as Intel, HP and Cisco, through international experts from Jordan, Egypt, From countries to review the role of technology in development for various economic sectors, including education, tourism and health. The session focused on the need to invest in the education sector and focus on technical education and the development of applied science in technological issues to achieve sustainable development and provide technical and technological services to various economic and entrepreneurial sectors in Palestine. Other experts and specialists discussed the latest session of the Technology Conference, “Outsourcing to the Gaza Strip: International Experiences and Guidance on Telecommuting.” Experts and specialists stressed that this meeting is an important factor in the Palestinian digital sector, especially Ghazi. The speakers stressed the importance of international trends towards telecommuting. Belgian and local experiences were also presented on the experience of outsourcing, in addition to discussing one of the most sensitive topics in the sector, problems and electronic payment solutions. The first day concluded with a marketing session for the services and products of the outsourcing companies, and was attended by many local companies including MAF, ATIAF, WordLinks, Developers Plus, WE Group, Newline, Webcam, Razan, Impact. It is worth mentioning that the activities of Expotech 2018 will continue from 25 to 27 September in various sessions between entrepreneurship and self-employment in cooperation with PICTI and YUKAS and empowering girls and women in the digital sector in cooperation with Al-Azhar University in addition to the technological camp in cooperation with Gaza University.